CPO Delos Henry Miller, Jr.
Delos Henry Miller Jr. was born on 12 June 1916 to Robert and Maude Fox in Cedarville, IL. He was later adopted by Robert's sister, Anna Laura, and her husband, Delos Henry Miller Sr.
Delos Jr. married Lillian Martha Miller on 8 May 1941. They had one son, James Robert Miller. 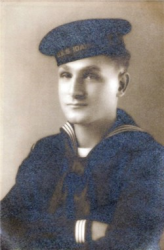 Delos Jr. served in the U.S. Navy from 4 September 1935 to 26 September 26 1961. 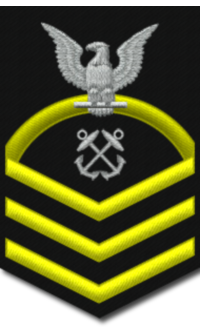 When he was honorably discharged from the Navy he had attained the rank of Chief Petty Officer. After leaving the Navy he was employed at the National Bureau of Standards in Boulder, CO.
Delos Henry Miller Jr. died on 23 May 1963 at age 46. He is buried at Lincoln Memorial Park in Oswego, Kendall County, IL.